Tutu Protests And Parties Break Out In Wyoming Over Senator's Remark : The Two-Way People are using the #LiveandLetTutu hashtag to share images of themselves wearing tutus, in response to Sen. Mike Enzi saying a man who wears a tutu in a bar is asking for it. University of Wyoming student Tyler Wolfgang poses in front of the university building that bears Sen. Mike Enzi's name. 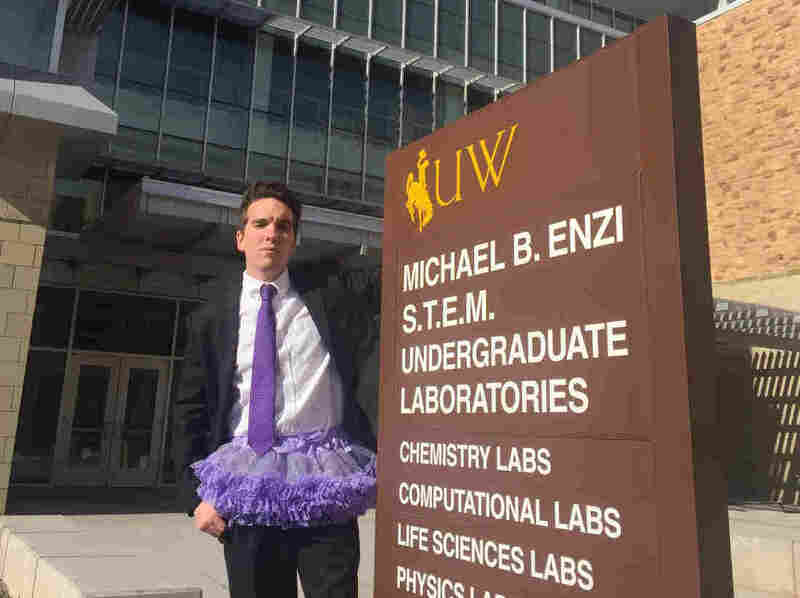 A week after Sen. Mike Enzi told high school students that a man who wears a tutu to a bar "kind of asks for" a fight, his constituents in Wyoming are wearing tutus to school and work — and, yes, to bars — on Friday. Enzi has apologized for his "poor choice of words." Protest parties are also scheduled through the weekend, and on Friday, people have been using the #LiveandLetTutu hashtag to share images of themselves wearing tutus. One image posted today showed University of Wyoming student Tyler Wolfgang wearing a suit and a tutu, posing at a campus building that bears Enzi's name. "Our hope with the state-wide [efforts] is that even in small communities we'll get a handful of people to share a photo of themselves in the bar wearing a tutu," one organizer, Patrick Harrington of Laramie, tells member station Wyoming Public Media, "so we can show Senator Enzi that he really is representing a large group of people and a really diverse group of people in Wyoming." Those efforts include a "tutu family game night" at a church in Cheyenne. Pub crawls are planned in Laramie, Pinedale, and Sheridan; bars are offering discounts to anyone in a tutu, and at least one establishment is also contributing part of its proceeds to gay pride events. "I know a guy who wears a tutu and goes to bars on Friday night and is always surprised that he gets in fights. Well, he kind of asks for it. That's the way that he winds up with that kind of problem." At the time, Enzi said his anecdote illustrated the need for civility and mutual respect, citing Wyoming's "live and let live mantra," as WPM reported. But he was quickly criticized for not succeeding in making that point — and for doing so in an inappropriate setting. Wyoming Democrats Chairman Joe M. Barbuto said Enzi's comment "was ugly and indicative of a kind of backwards thinking that has no place in today's society." On Tuesday, Enzi, 73, issued an apology, saying, "I regret a poor choice of words during part of my presentation." He added, "None of us is infallible and I apologize to anyone who has taken offense. No offense was intended. Quite the opposite in fact, and so I ask for your understanding as well." The plan for a tutu protest was met with enthusiasm in Wyoming, even prompting a tutorial on making one's own tutu in Laramie Thursday night. Demonstrators were also urged to keep the issues of bullying and civil rights in mind, with Ezra Hanson urging their fellow protesters, "Wear your tutu's this weekend but please take it seriously. Some of us 'wear tutus' on a daily basis and I would really appreciate it if you didn't try and make a joke out of yourself while wearing one." Hanson continued, "Respect the cause, respect the oppressed. Stand up for something, but be aware of yourself, and be aware of the image you will be branding us all as having. Most importantly, be safe. Much love to everyone." A previous version of this story misidentified one of the protestors and their choice of pronoun. Their name is Ezra Hanson.